Which makes a better pet: a cat or a dog? I'm sick & tired of this same old debate! 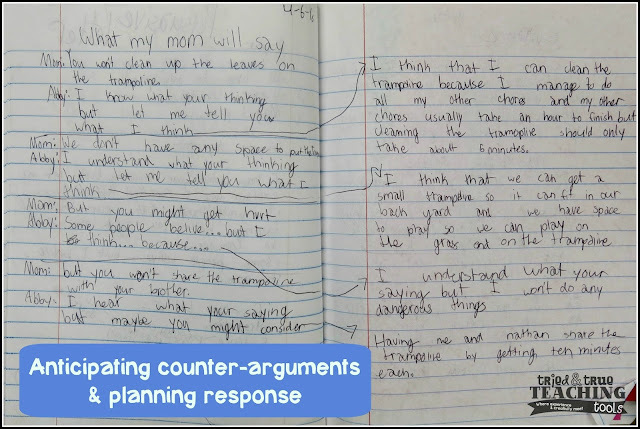 I want to teach my students meaningful opinion and persuasive writing. Similar to teaching craft moves in reading, teach the art of persuasion through writing! 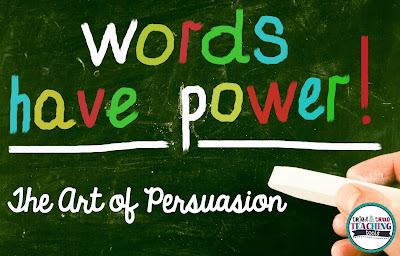 We first began immersing our students in persuasive mentor texts. Either during Read Aloud or at the beginning of the Writer's workshop mini-lesson, I read one of the picture books to the class. We would stop periodically to discuss which persuasive tactics the author was using. All of these books are hilarious, but make their point. Each book states an issue, then gives reasons and counterarguments. After reading each one, we made an anchor chart of the persuasive tactics used. 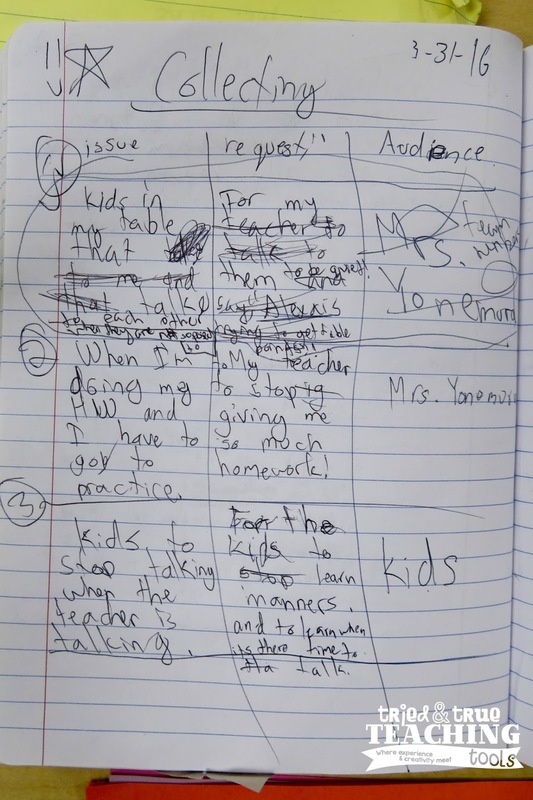 Students copied these down in their Writer's Notebooks, then tried out the tactic. At the same time, students collected (listed) issues that bugged them, what they'd ask to change (request), and who they would ask. This was great in eliminating senseless whining. Requests ranged from less homework, to asking to stay home alone, to better school lunches, to getting a dog. I loved reading about the issues! After several days of collecting their issues & requests, students selected one seed idea. We set guidelines for what makes an effective request, as well as taught them how to ask for what they want. 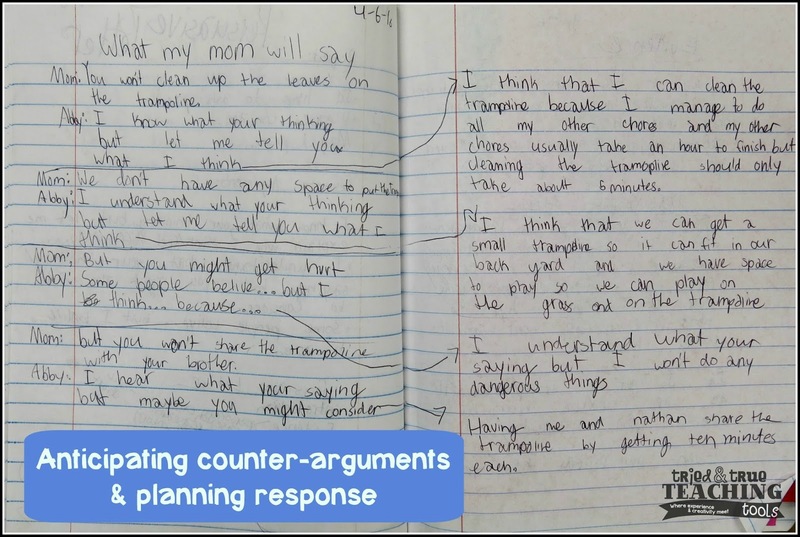 The kids had the most fun with anticipating counter-arguments from their audience. To make their request more credible, I gave students one Writer's Workshop session on the iPads. 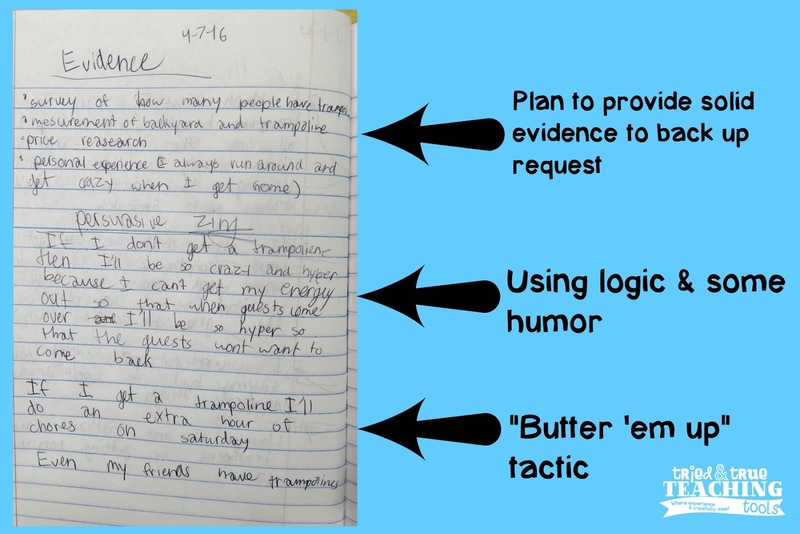 They were to look up research to support their requests; this made a HUGE difference! Many students also spent time surveying their peers to acquire data as evidence. 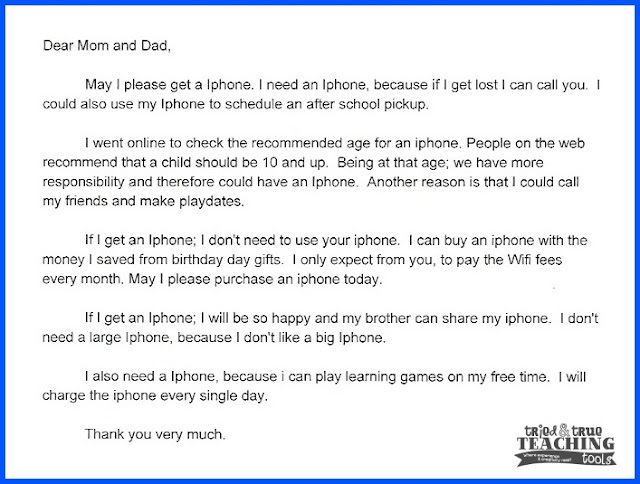 Sounds pretty convincing to me! 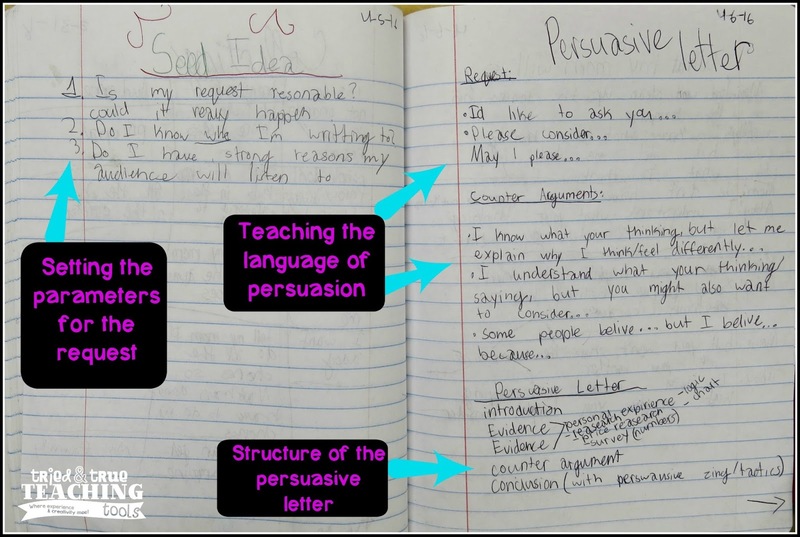 How do you teach persuasive writing to your students? I'd love to hear your ideas! I love using picture books to provide examples of certain writing styles. I use several of those in your photo for my own argumentative writing unit. Thanks for sharing. 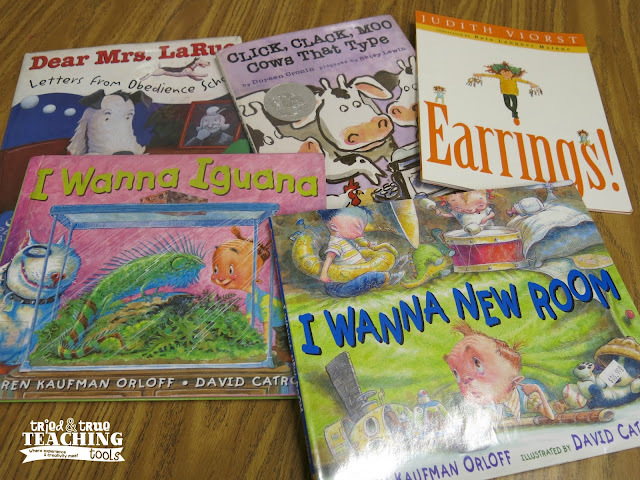 I love picture books, too, no matter the age of my students! Thanks for stopping by, Marcy!